The curtain is closing on January and already have I failed to start on some of my so-called "new years resolutions". Okay, okay, you're right, I'm being way too hard on myself because I've got like eleven months left to procrastinate get something accomplished in 2016, right? I should probably take a motivational cue from Muhsinah, who is planning a big year, but is taking things at her own pace, month by month. The D.C. electro-soul darling is truly making 2016 into a musical affair, as each month she is dropping a brand new EP. Yep, it's #MuhsinahAllYear, with all-new songs from her every single month. Sweet! 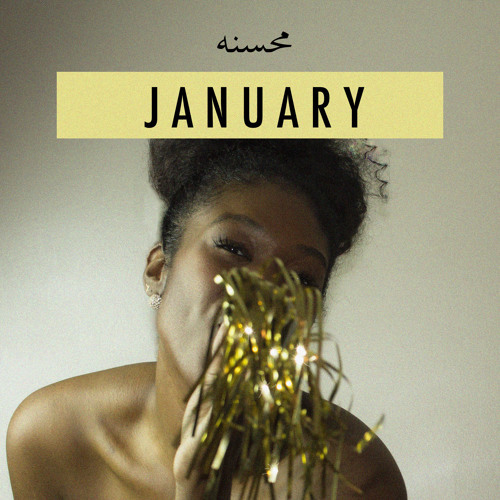 She kicks things off with January, a four-piece collection that may be small in stature, but is big on beats and vibes. Picking up here her 2014 'sonic mood ring', M, left off, Muhsinah culls a collection of material that shows the duality of the month, where it goes from the New Years par-tay (the totally '90s re-re-fix of "Let Me Out" (feat. De La Soul's Pos Plug Won), the spangly "Magical") to the warm up by the hearth (the wintry and wistful, "It's You"). For your winter days, and your holiday reminisces, January is a treat for the ears, and the best part is that there are more monthly aural treats to come. 1 month down and 11 more to go as the Year of Muhsinah commences!